Neighbourhoods are the building blocks of society. They are the places we call home, where we live, work, and play. But what are the characteristics of a livable, vibrant, sustainable neighbourhood? 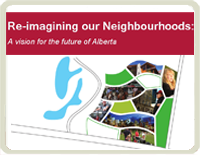 Re-imagining our Neighbourhoods: A vision for the future of Alberta, begins to answer exactly that question. A contribution to the Alberta Real Estate Foundation’s 20th Anniversary Thought Leadership series, the report builds on The Natural Step Canada’s experience working with dozens of communities across the country to accelerate change toward sustainability over more than a decade. Over several few months, The Natural Step Canada engaged people in a dialogue about what sustainability means at the neighbourhood level. This report provides a summary of ideas gathered from Albertans through a survey and an online forum, as well as from experts from across Canada through interviews. What are the characteristics of a sustainable, vibrant, livable neighbourhood? What are the current barriers and obstacles to social, economic, and environmental progress? What are the steps we might take to move toward a desired future in our neighbourhoods?